For the last couple of weeks I’ve had this this low-grade summer cold which has made me less energetic than my normal self. It hasn’t, however, stopped me from making dinner parties. What I’ve tried to do is make less complicated and time-consuming dishes and give myself a bit of a break. 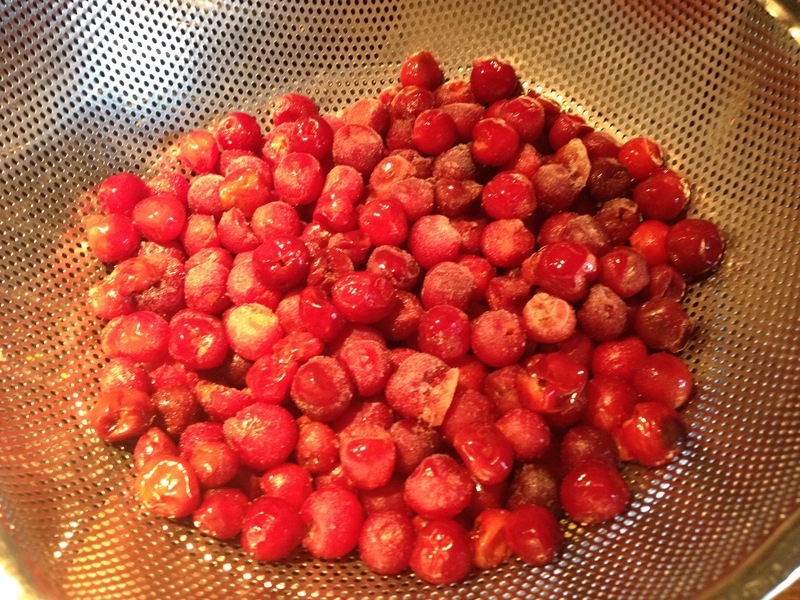 As most of my regular readers know I bought a flat of sour cherries at the market a few weeks back and so now have a freezer full of ready to use frozen sour cherries. 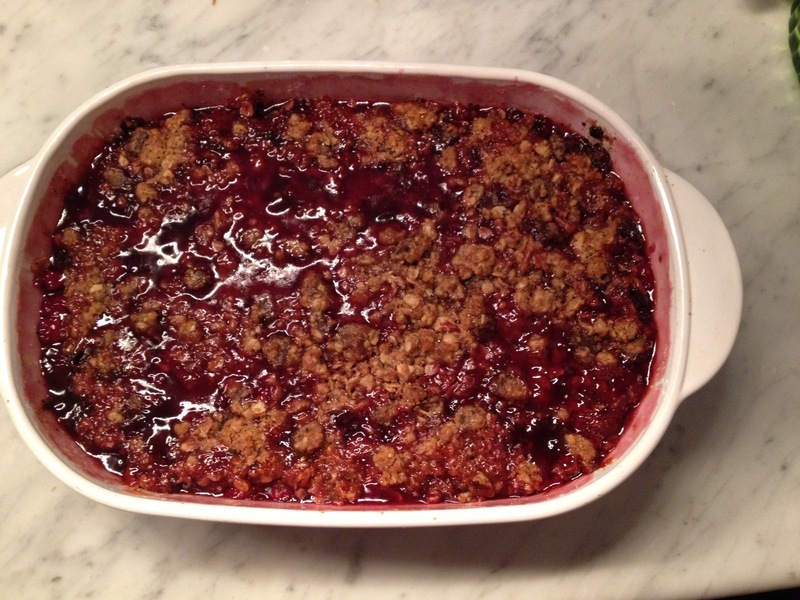 I love a crumble, they certainly are easy, but I was hankering for something that paired sour cherries and chocolate, had anyone made a sour cherry chocolate crumble and posted it on these here interwebs? No, at least not that I could find. Everything I found was for some variation of a chocolate cake with sour cherries, think Black Forest Cake or brownies with dried cherries. Not what I wanted. It couldn’t be that hard right? Indeed it was very simple. In a large bowl add: 1 cup old fashioned rolled oats, 1/2 cup of toasted roughly chopped pecans, 1 cup of all purpose flour, 1/4 teaspoon of cinnamon, 6 tablespoons of Brown sugar, 2 Tablespoons of white sugar, 1 cup of dark (or milk) chocolate chips or chunks cut from a large slab of chocolate and a generous 1/4 teaspoon of salt. With your hands mix in 12 Tablespoons of unsalted butter. In a large bowl add: 1 cup of sugar and 3 Tablespoons organic cornstarch, tapioca flour or just regular flour wisk together then stir in the cherries. Finally fold in 1-2 Tablespoon of kirsch or brandy (optional). 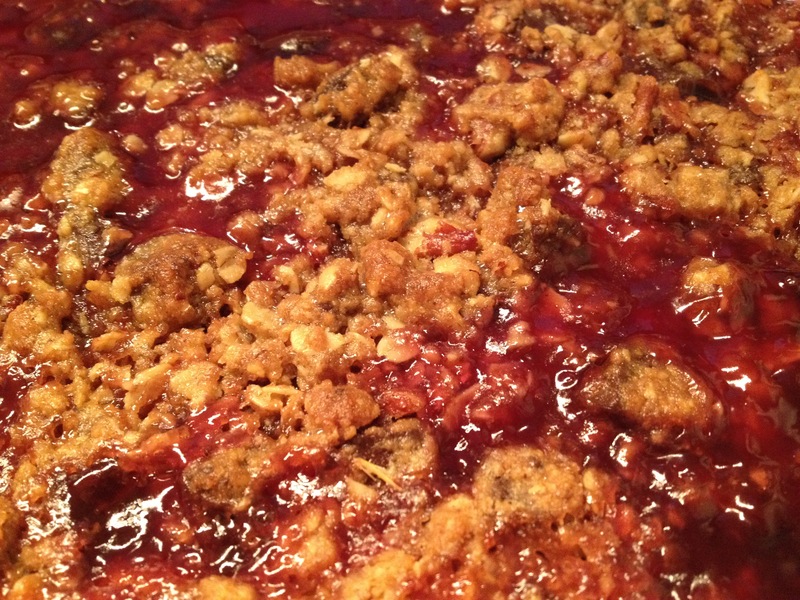 Place the cherries in a 2-3 quart baking dish and top with crumble. You will have a nice thick layer of crumble. Bake for 45-55 minutes. When ready the top should be brown and the fruit bubbling. Serve with unsweetened whip cream or vanilla ice cream. 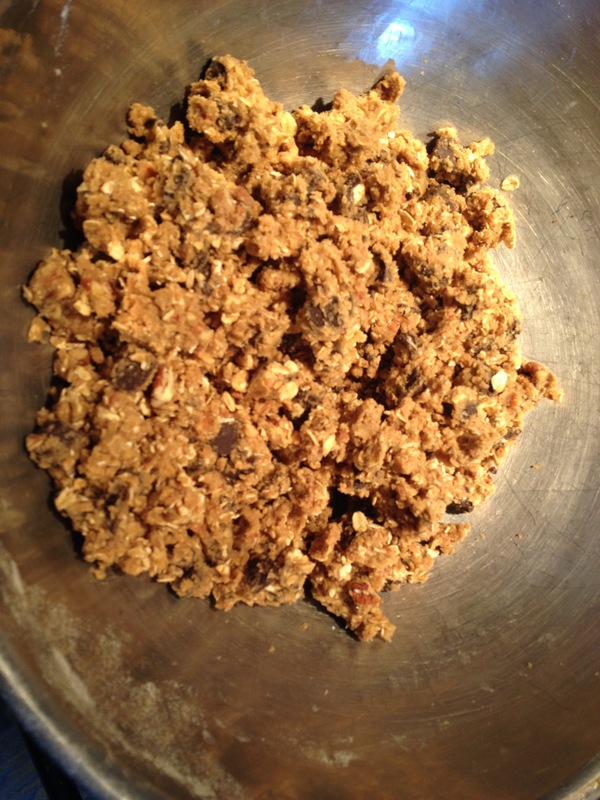 This entry was posted in Recipes and tagged chocolate, crumbles, recipes, Sour Cherries, sour cherry chocolate crumble. Bookmark the permalink.